Frank Gigax was born on 7 April 1856 at Zanesville, Muskingum, Ohio, USA.1 He married Esther Ardelia Haldeman, daughter of John Spohn Haldeman M.D. and Abigail Stevens Williams, on 11 July 1879 at Zanesville, Muskingum, Ohio, USA.2 Frank Gigax died on 6 April 1939 at Zanesville, Muskingum, Ohio, USA, at age 82; Frank Gigax Obituary.1 He was buried on 9 April 1939 at Fultonham, Muskingum, Ohio, USA. Additional information: Was part-time preacher in Methodist church. Ran meat market as main job. This information is from a chart given to Rusell T. Arndts by Ruth Hurlbert. The chart is called the Paternal Family Tree. The word "Maternal" is crossed out and the word "Paternal" has been added. The 'Haldeman book' says, Ardelia Ester Haldeman was married in July 1879 to Frank Gigax, father of the bride, Dr. John S. Haldeman performed the ceremony in the Seventh Street Methodist Church in Zanesville, Ohio. [S23] Unknown name of person, unknown record type. Frederick Gigax was born in 1816 at Bleienbach, Launek, Bern, Switzerland; Old documents sometimes refer to the country as the "Republic of Bern. "1 He, the father of Frederick Gigax, presented him for baptism on 16 June 1816 at Bleienbach, Launek, Bern, Switzerland; Old documents sometimes refer to the country as the "Republic of Bern. "1 He married Anna B. Gilgen on 19 February 1842 at Republic of Bern. A certificate of baptism for Frederick, b.31 March 1844, gives his parents as Anna Gilgen of Riieggisberg (it may be Rueggisberg -- spelling unclear) and Frederick Gigax, s. of Jacob of Bleienbach. Jacob Gigax is a witness, b. of the son. This inforamtion is from a chart given to Russell Arndts by a woman named Ruth. It appears that Frederick and Hannah came to the USA in 1851. The last child recorded to have been born in Switzerland is Sophia (b.1851). After coming the the USA, the spelling of the last name was changed in this branch of the family from GYGAX to GIGAX. Other branches maintained the Old World spelling. 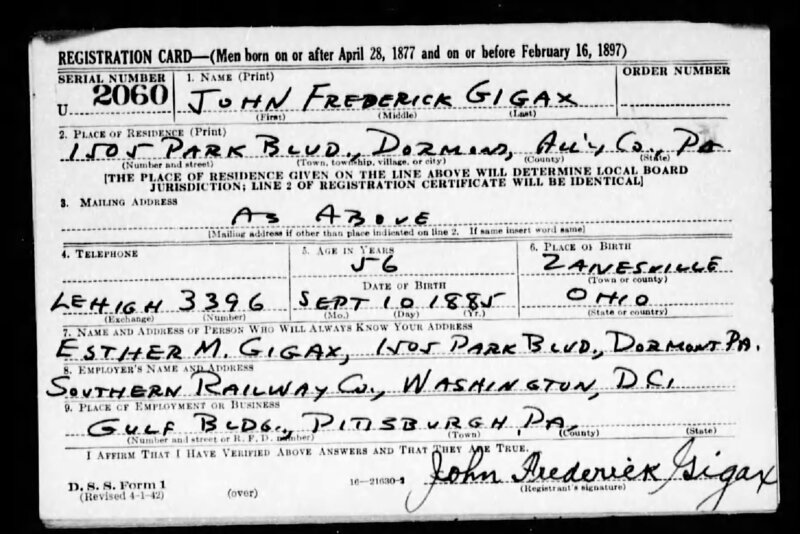 Frederick Gigax was naturalized on 10 October 1859 at Zanesville, Muskingum, Ohio, USA. He died on 6 January 1899 at Zanesville, Muskingum, Ohio, USA. Grace Naomi Gigax was born on 31 March 1918 at Pittsburgh, Allegheny, Pennsylvania, USA.1 She was baptized in May 1918 at Pittsburgh, Allegheny, Pennsylvania, USA.1 Her married name was Moore.1 She died on 15 November 2009 at age 91; Several online trees have this date of death, but none cite a source. Helen E. Gigax was born in 1890 at Muskingum, Ohio, USA. She never married and stayed in father's house as an adult and taught piano.1 She died on 18 September 1954 at Muskingum, Ohio, USA. She was buried on 21 September 1954 at Fultonham, Muskingum, Ohio, USA. [S73] Unknown record type, 700 Pennsylvania Ave., NW, Washington, District of Columbia, USA. Collection: Ohio Births and Christenings, 1821-1962. Jeppie Milton Gilbert was born on 17 May 1910. He died on 3 February 1973 at age 62. [S275] 1850 U.S. Census, 700 Pennsylvania Ave., NW, Washington, District of Columbia, USA, Census Place: District 55, Roanoke, Virginia. [S279] Margaret Jane Masters, Death Cerfiticate. child recorded to have been born in Switzerland is Sophia (b.1851). The chart gave her name as: Hannah (Anna) B. Gigax. She was also known as Hannah B. Gilgen.1 Her married name was Gigax.1 She died on 1 March 1889 at Muskingum, Ohio, USA, at age 67. Catherine 'Katy' Gill was born in 1863. She died on 10 April 1873 at Painesville, Lake, Ohio, USA. Ellen Gill was born in 1855. She died on 23 November 1931. Honora Gill married William O'Leary on 15 May 1852 at Painesville, Lake, Ohio, USA. 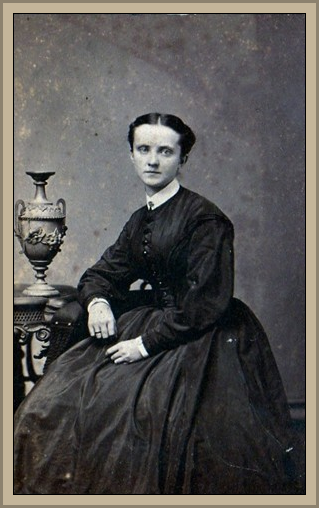 Honora Gill was born on 7 May 1854 at Painesville, Lake, Ohio, USA. Her married name was O'Leary. She died on 19 September 1926 at Painesville, Lake, Ohio, USA, at age 72. James Gill was born on 26 December 1827 at Kilkenny, Ireland. He died on 10 April 1904 at Painesville, Lake, Ohio, USA, at age 76. He married Catherine Carroll, daughter of Thomas Carroll and Ellen Lynch, in June 1953. James Gill was born in 1859 at Painesville, Lake, Ohio, USA. He The following information was imported from the GEDCOM utility, anddid not correspond with any existing data fields in this system. 2ndMiddle. He was also known as /Gill/. He died on 23 February 1893 at Painesville, Lake, Ohio, USA. Jane Gill was born in 1867 at Painesville, Lake, Ohio, USA. She died in 1940 at Painesville, Lake, Ohio, USA. John Gill was born in 1869. He died on 21 November 1944 at Painesville, Lake, Ohio, USA. Margaret Gill was born in 1865 at Painesville, Lake, Ohio, USA. She married James Joseph Kirby, son of Henry Kirby and Susan Sexton, in 1885. Her married name was Kirby. Margaret Gill died on 3 February 1929 at Ohio, USA. Mary Gill was born in 1861 at Painesville, Lake, Ohio, USA. She was also known as Mary Kirby. She died on 21 November 1897 at Painesville, Lake, Ohio, USA. Thomas Gill was born in 1857. He died in 1882. Margaret Gilmore was also known as Margaret Hunter.